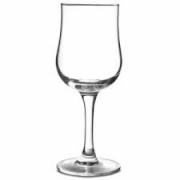 With a range of wine glasses this big, we’d be surprised if you couldn’t find a branded wine glass suitable for your promotional event or campaign. With over 30 wine glasses to choose from, you have a choice of traditional styles red wine, white wine and champagne flutes as well as the more contemporary styles of the Crysta III Champagne Saucer and the Monte Carlo range. Our Wine Taster is perfect if you are running a tasting session or sampling a new product. Branded wine glasses are a great gift item to clients and customers at the end of the year, while they are also a good choice for promotional merchandise for tourism venues where your customers are more likely to buy souvenirs for themselves or family members in memory of their holiday. Our promotional wine glasses are a high quality product which will look good in any restaurant, bar, hotel, function centre or corporate gift item. Team up your choice of glassware with one of our gift boxes for the perfect presentation to any of your corporate clients. All of our wine glasses can be printed with your logo print or message, and the great thing about branded wine glasses is that they will be used over and over again, keeping your brand in the front of your customers mind. If you need a branded wine glass for your next promotional campaign, you can’t go past our range.